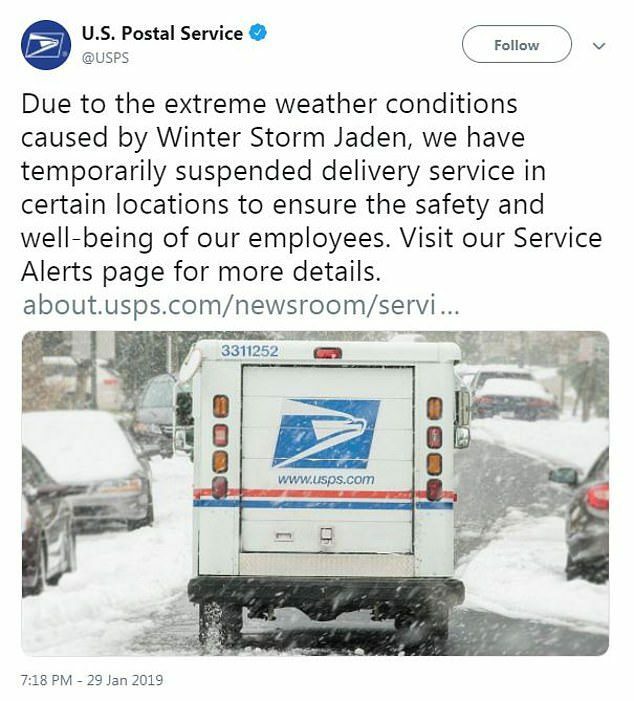 ‘Due to the extreme weather conditions caused by Winter Storm Jaden, we have temporarily suspended delivery service in certain locations to ensure the safety and well-being of our employees,’ a tweet from the official USPS account posted late on Tuesday read. 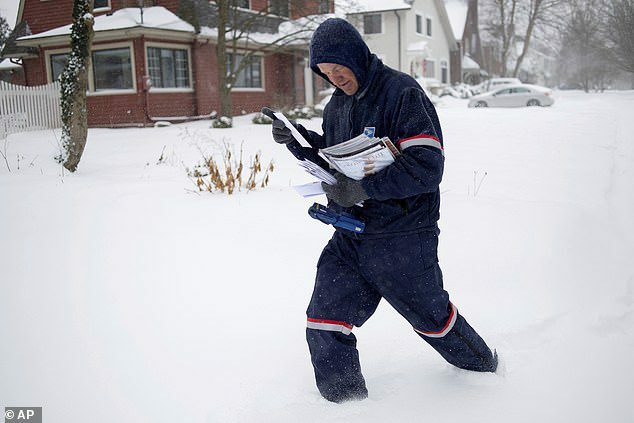 USPS said it would suspend mail delivery on Wednesday in parts or all of North and South Dakota, Nebraska, Iowa, Illinois, Indiana, Ohio, Virginia and Michigan, as the National Weather Service forecast plunging temperatures from one of the coldest air masses in years. The latest update on USPS service disruption was posted at 8am Eastern. 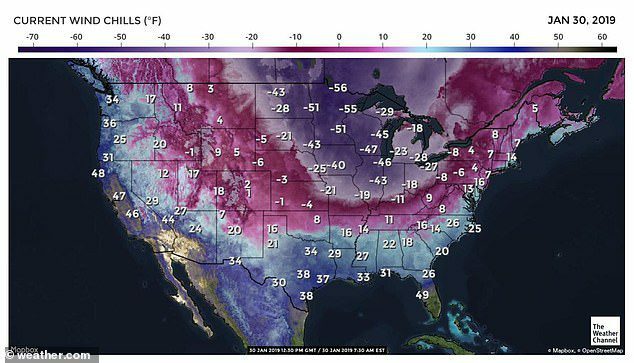 But the motto doesn’t say anything about extreme cold, and the weather forecast including record low temperatures in eight states shut down postal operations on Wednesday. ‘Weather forecasters are warning of dangerously cold conditions in parts of the nation. 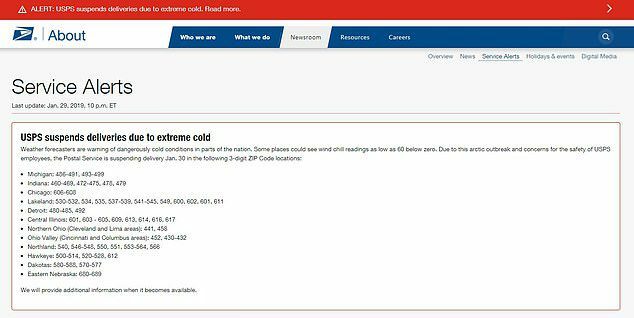 Some places could see wind chill readings as low as 60 below zero,’ the service alert from USPS said. But elsewhere, mail delivery continued as usual, even with temperatures below zero degrees Fahrenheit. In another part of Ohio for example, one postal worker told DailyMail.com, ‘Just another day in Canton,’ confirming that delivery of parcels and packages had been carrying on, as per usual. In Canton, the low on Wednesday was negative four degrees Fahrenheit (negative 20 Celsius), warming up ever so slightly to negative one Fahrenheit (negative 18 Celsius) by 9am Eastern. Officials presiding over many government functions throughout the Midwest were focused on protecting vulnerable people from the cold, including the homeless, seniors and those living in substandard housing. Some buses were turned into mobile warming shelters to help the homeless in Chicago, where temperatures plunged to negative 19 degrees Fahrenheit (negative 28 degrees Celsius) early on Wednesday, breaking the previous record low for the day set in 1966. In Chicago, major attractions closed because of the bitter cold, including the Lincoln Park Zoo, the Art Institute and the Field Museum. 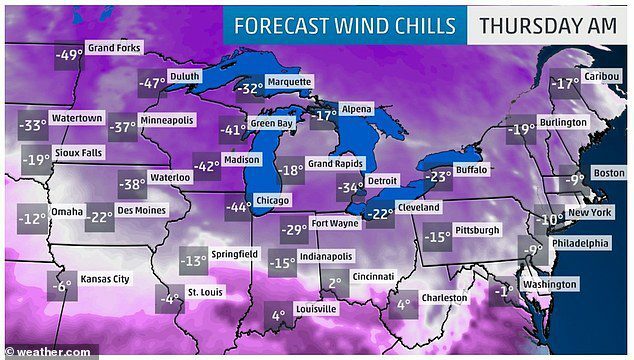 A wind chill of negative 25 degrees Fahrenheit (negative 32 degrees Celsius) can freeze skin within 15 minutes, according to the National Weather Service. The extreme cold hitting the US is attributed to a sudden warming far above the North Pole. A blast of warm air from misplaced Moroccan heat last month made the normally super chilly air temperatures above the North Pole rapidly increase. 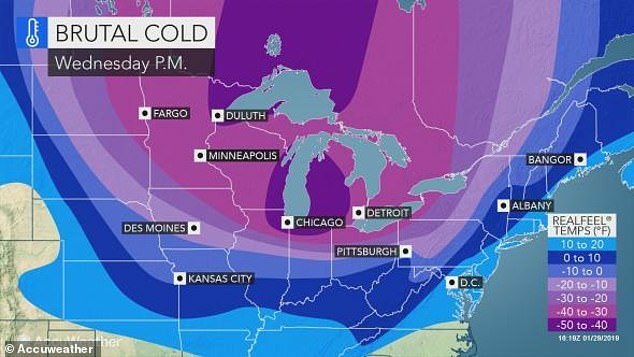 That split the polar vortex into pieces, which then started to wander, Judah Cohen, a winter storm expert for Atmospheric Environmental Research, said. Those concerned about their mail service can check back for service alerts on the USPS website.